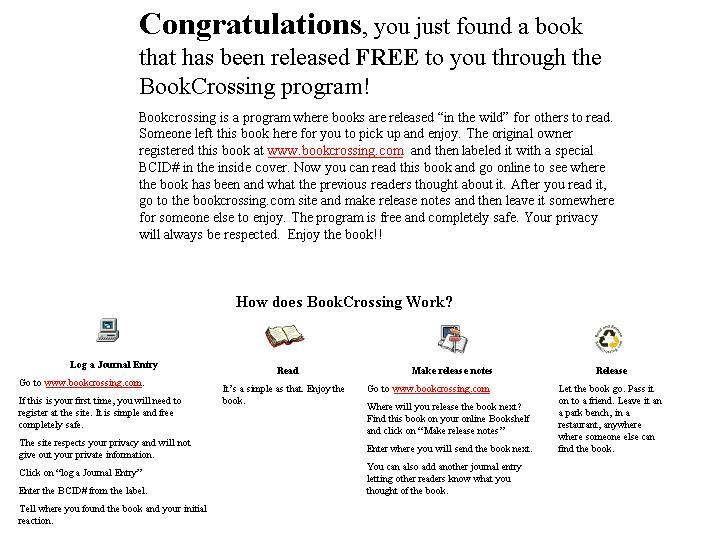 On this page you will find files to download for use in BookCrossing. These are available free to you to use as you release books, etc. Click on the links below to download files. I use full page labels or regular paper and packing tape. BookCrossing Explanation insert:This is a presentation I created on powerpoint to explain with pictures just what BookCrossing is and how it works. I turned it into a jpg picture, so you won't need to download it. Just right click and save to your computer. It is an 8x11 size picture, which can be folded and slipped into a book. 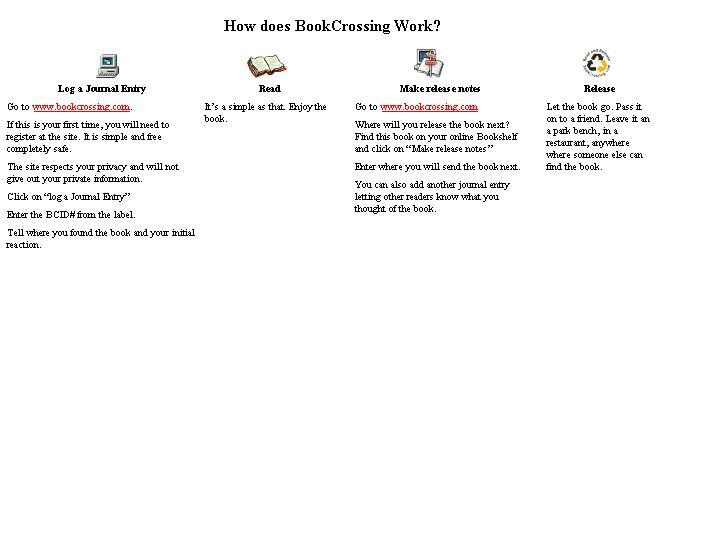 A Simpler version of the "How to BookCross" flyer How Does BookCrossing Work? Here are several versions of notes I made to be stuck on the last page of a book to encourage journaling. They are of varying length and content, so check them all out to find the one that meets your needs. Print on paper and tape them in or use full sheet labels and cut out and stick in the book. Don't forget to add the book's number in the web addy! Version 1 Long narrow text, reminding reader to make a journal entry. Version 2 Another short version for the bottom of the last page, asking readers to share their thoughts on the book. Version 3 This one encourages the reader to "take the book back to the library". Reminding them that with BookCrossing the world is a library. Version 5 One line note. These are labels that I use when releasing books in geocaches. Geocachers are used to tracking specially tagged "Travel Bugs", much the way we track books. So to encourage the logging of books, I encourage cachers to treat them like travel bugs. These are labels for books I want to travel only by cache. I place one on the outside to grab the attention of the cacher and to let them know there are instructions inside. The inside label explains how to log the book. I use these labels on books that don't neccesarily have to stay in a cache once picked up, but do alert the cacher to the responsibility of logging the book if they pick it up. Again there is an outside label for the front of the book, and further instructions on the inside label. Here is a little label I created using the text from the BC stamp and the graphic created by TuBaW.